Go Shuck An Oyster: Support Oyster Restoration in MD - "Sprint for Spat"
Support Oyster Restoration in MD - "Sprint for Spat"
On April 18, 2010, runners will take over downtown Silver Spring, Maryland for the "Sprint for Spat" Earth Day 5K to show their support of oyster restoration in the Chesapeake Bay. Net proceeds raised at this race will help build an oyster sanctuary in the Chesapeake Bay. The Goal? Raise $25,000 to plant 5 million baby oysters (called spat) in Maryland waters. Sign Up For The Race: After you've registered for the Earth Day 5K, create a fundraising page on firstgiving.com and ask your friends and family to donate money for oyster restoration on your behalf. Make A Donation: Can't attend the race? 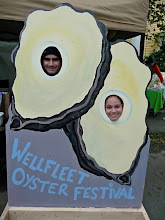 You can still make a donation to support this oyster restoration project. For more information on Oyster Restoration in MD, visit The Nature Conservancy. Restoring Our Oyster. Cleaning Our Bay. Preserving Our Future.